Searches can include fewer criteria for broader search results, or more criteria for narrower search results. Type a phrase in the Search field. Press the Enter key on your keyboard or click the Search button. A search is triggered and the results display. You are ready to refine the search. You can refine your search criteria using the following techniques. Important: When you select a new value, a fresh search is automatically triggered and results are updated. Type some text into the Search text field, and press Enter or click Search to refresh the current search. From the appropriate Results Breakdown category, click on the value you wish to add. For example clicking 4 in the Bedrooms bin will add "4 bedrooms‟ to your search criteria. In the list of search criteria already entered, click the current value to change. Select or enter the substitute value and click "OK". A pop-up menu displays alternate criteria. The format of the alternatives depends upon the category. Note: This option may show a sliding rule (baths, beds), a list (property type), a text box to add values separated by a comma (for keywords), or a range (price). To run a search with multiple Property Types or Statuses, click the current value already entered. A pop-up menu will display a list of options. 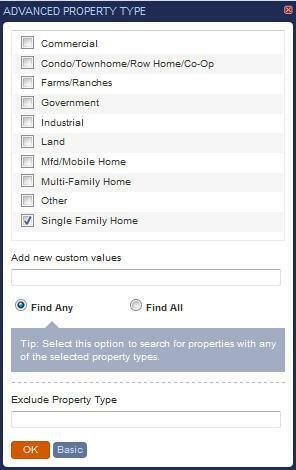 Check the box next to each Property Type or Status you wish to add to your existing search. Advanced options similar to Advanced Keyword Search appear by clicking the Advanced button. Once you have added the desired criteria, click OK and your search will be updated and Find will return search results based on your selection(s). In the search criteria list, hover over the name of the category to be removed. The category is removed from the search list and a new search is triggered. When you type a search value into the text box, Find interprets it and chooses the appropriate category. Occasionally, this interpretation is incorrect. You can easily switch categories to correct this. For example, if you enter '1000-4000' meaning Square Footage, Find interprets this as "Price: $1000 to $4000‟. You can easily switch this category from Price to Square Footage. Click the name of the category to change. Click the dropdown arrow to display a list of categories. Select the correct category and click OK. The switched category displays in the Search Panel. Tip: If the desired category is not listed, delete the incorrect category and select the correct one to use in the Results Breakdown panel. Next Lesson: Saving Searches in Find.